The Mosets Tree Radius Search plugin allows you to add a field into the native search form to be able to add both center point and radius distance criteria to the Mosets Tree search native function. It works in conjunction with - and is entirely integrated within - that form. You can search just by radius distance or with any combination of native Mosets Tree search criteria. 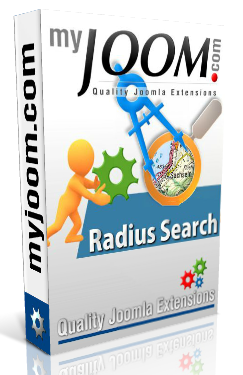 The MyJoom Radius Search Plugin for Mosets Tree allows you to add a field into the native Mosets Tree search function. This field allows the user to enter any type of address (street and/or city and/or ZIP and/or any data that can be located in Google maps). Once the user start to type a place name, the fields try to complete the user’s query (exactly like the maps.google.com search input box). The user could also use an optional ‘Locate me’ button to geocode their position (useful for mobile users like iPhone, iPad, Android and newer browsers). In order to work, Mosets Tree Radius Search plugin needs to have geocoded entries (entries with latitude and longitude). For this you can use Mosets Tree backend geocoder, or Geocode Factory Batch geocoder. The result can be displayed on Geocode Factory 5 maps (Mosets Tree Gateway plugin is required).